Just over 20 years ago I was in my first job where I used a computer a lot – they had me working like a slave over many documents. Consequently my eyes started to hurt. Not too far down the track I got my first pair of spectacles – nice big framed 1980s ones which I still have because I can’t throw out a perfectly good pair of glasses. Never mind that I will probably never wear them again and even if I did the lenses would need to be changed. I’m long sighted and staring at a computer screen all day gave me bad eye strain, hence the glasses alleviating that pain. I’ve cruised through the past 20 years with two new pairs of glasses and not too much of a change in strength. That is, until recently. In the last year or so I’ve noticed that I have to read things in good light otherwise it’s just too hard. I’ve also noticed that it takes longer to get something at the right distance and in focus so it’s comfortable for my eyes to read. As it had been two years since my last eye check I went and had another one and the outcome was that I needed to upgrade my glasses because my eyesight had deteriorated markedly since my last prescription about four to five years ago. There is a name for this eyesight deterioration. The common name is ‘You are now 40 plus and your eyesight is deserting you along with your youth’ and the more scientific name is Presbyopia. 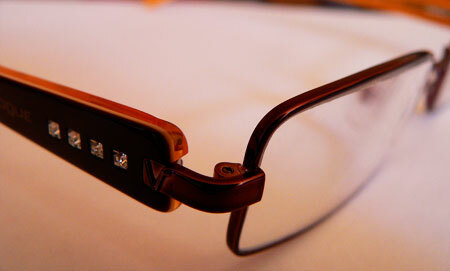 Because my new glasses are much stronger from my old ones they took a while to get used to. It’s also made me realise that this is just the beginning of eyesight deterioration. They aren’t going to get any better and I will soon be at the stage where I will need to take my glasses everywhere so I can read. I haven’t got bi-focal glasses as I couldn’t face that just yet. So if someone talks to me at work I peer over the top of my glasses. It reminds me of watching people doing exactly the same thing. Soon my glasses will be perched on the end of my nose when I’m not doing closeup work because I can’t be bothered taking them off. At the moment my glasses stay in my work handbag because work’s the main place I use them. If I’m doing a longish stint on the computer at home (like now) I’ll put them on but I still read books and the newspaper without them. I can see a time where I will need to keep them on me at all times so I can read the labels on grocery products and menus at restaurants when I’m out. Oh I feel for you – sort of! I first wore glasses at 13 when I found out that other people could actually see the blackboard without squinting, could see nails in floorboards and could travel distances without throwing up every 20 minutes. Its amazing what other people could see. I live in the smug knowledge that when I get very very old, I may not need my glasses as much – as people do get more long sighted, and as a myopic the thought that my focus may shift further than the end of my nose heartens me. Jeanie, hopefully you won’t need to wear glasses later on. I do realise I’ve been pretty lucky in not having to really wear glasses much up until now. In my case I’ve worn glasses as long as I can remember – I was very short-sighted. I was a bit like Jeanie – amazed to discover how much I had missed before I got them. Since I’ve had lasik surgery my eyes are now relatively normal (still a teensy bit short-sighted though – but not enough for glasses), and I’m told eventually age will catch up with me and I’ll become long-sighted. A friend of mine will be having lasik surgery when he goes to Asia (Thailand I think) in a couple of months. Not only can you get cheaper plastic surgery, lasik surgery is cheaper too. Getting older ain’t for sissies, is it? You wait — another twenty years and you’ll have caught up with me and realise that without your reading glasses on a string around your neck you DAREN’T even THINK about going to the supermarket! I actually carry a spare folding-up non-prescription pair in my handbag “just in case”. On another tack I got the promised camera for my birthday last week — now I have to learn to use it. Any special that you want me to practice on — like the British Library or the new St Pancras station? Hazel, I might be one of those people who wear glasses around my neck or I’ll go down the bi-focals path, or I’ll get surgery. Don’t know yet. Anything you want to practise your photography on I’d love to see. It’s been nearly 8 years since I was in London!